Austin, Texas rock duo One-Eyed Doll have gained an exceptionally loyal and rapidly growing fan base since 2006 with consistent touring around the world, a solid memorable live performance, and a DIY connection with the fans. The band’s live set featuring just Kimberly Freeman on guitar and vocals and Jason Rufuss Sewell, AKA: “Junior” on drums. They sometimes tour with friends adding additional instruments as well. 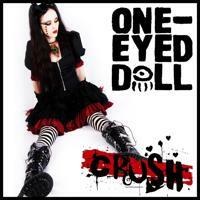 One-Eyed Doll is an interactive fan-friendly experience that’s both heavy/sinister and sweet/vulnerable. Their darkly humored, intense, sometimes quirky and theatrical rock and roll captures the hearts of metal, rock, goth and punk all-ages audiences night after night.